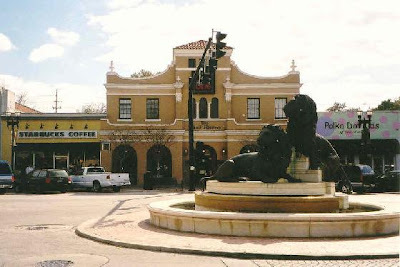 For the past month, I’ve been based in Orange Park, a suburb of Jacksonville that the locals call “the OP.” But truth be told, I could be in any newish suburb of any mid-sized city. Everything around me is a franchise, from the hotels (Holiday Inn, Ramada) to the restaurants (Outback, Red Lobster) to the stores (Target, Walmart). Sadly, this is the story of modern real estate development. A nationwide homogenization is in process, with every city following an identical formula. The sameness can be both familiar (“I know I can find it at Walgreens”) and disorienting (“Do I turn after the third or fourth strip mall?”). At times, you really could be anywhere. But even out here in the burbs there are reminders of the way things used to be. 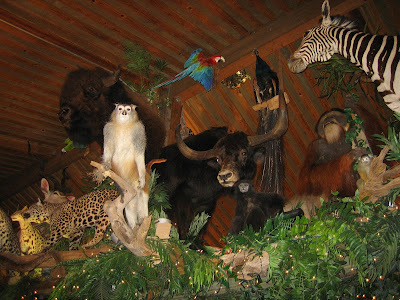 A particularly colorful example is the fish camp restaurant genre. Apparently they’re common in the South, and usually situated in the location of a former bait shop or marina, but I had never encountered one before. Perhaps it’s because I didn’t grow up in a fishing paradise. But with the massive St. Johns River dividing the city in half, and creeks and offshoots all over the place, Jacksonville is a town full of water. It’s a small miracle if you drive 10 minutes without crossing a bridge. So to get a deep-fried taste of the fish camp concept, we visited the two best-known ones: Clark’s Fish Camp (established 1974; pictured above) and Whitey’s Fish Camp (established 1963). 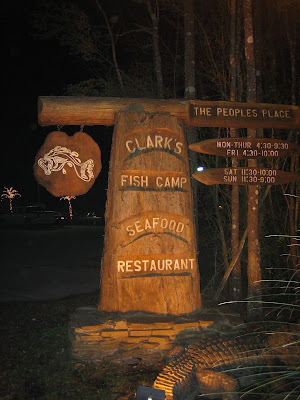 Both are rustic waterfront shacks that have been expanded and adorned with dead critters, although Clark’s takes the latter to another level. 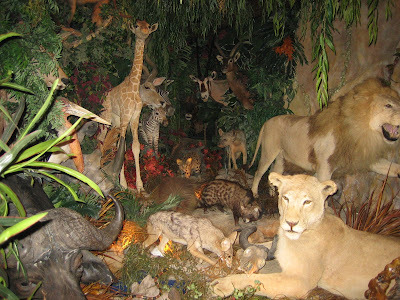 It’s like a taxidermy shop meets Alice in Wonderland. Or a National Zoo of the dead. It’s hard to describe how over-the-top the embalmed scenery is, so I’ll let the photos speak for themselves. Suffice to say there are hundreds of once-living animals “roaming” the place, and there was even an angry bear leaping over my head as I ate. The extensive menus are basically a list of fried __________ (fill in the blank with any seafood.) 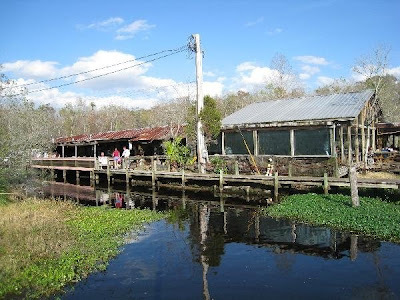 But fish camps are also famous for frying up exotic things like gator tail, frog legs, ostrich, turtle (“cooter”), antelope, rabbit, swamp onion and more. Having just watched Bear Grylls kill and eat a snake on “Man Versus Wild” – without breaking a sweat, of course – we gamely ordered two of Clark’s “Call of the Wild Appetizers”: fried kangaroo and boa constrictor. The verdict? 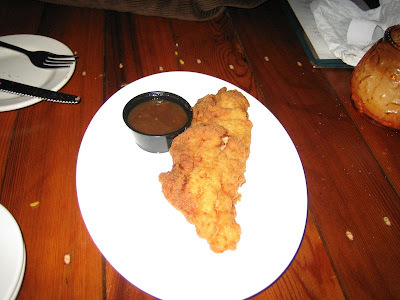 All weird meats do not “taste like chicken,” as the waiter described. The kangaroo tasted more like steak or venison, and if I didn’t feel so guilty, I’d have it again. The snake (pictured below) just plain sucked. It was flavorless and incredibly tough. We’re talking five minutes to chew one bite. I do NOT recommend it unless you’re really and truly starving in the Amazon. My conclusion is that fish camps are a delightful holdout of the Old South. They’re lively, they’re down home, and they’re filled with locals, which is always a good sign. The adventurous menus may get your eyes bulging, and the taxidermied herd might make your hairs stand, but the trick is to just stay calm and order the catfish, people. Its really great to see such a blog!!!!! Clark’s Fish Camp and Whitey’s Fish Camp IT WAS AWESOME WHEN I WAS ARRIVED .... AND NOW IT WAS MORE BETTER THAN PREVIOUS!!! !